Loud applause erupts amid the trumpet blasts and whining of violins that practically weep over each note as they accompany powerful voices singing of love and betrayal. Mariachi music, one of the great folk genres of Mexico, has gained a strong following in the South America nation of Ecuador, and its practitioners here have come together to compete. 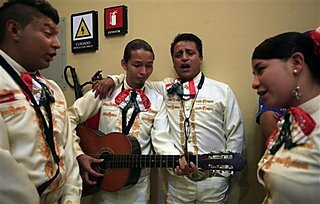 Dressed in traditional "charro," or Mexican cowboy outfits, band members practice nervously before they called up onto the stage, tooting a horn, or strumming the strings of a bass guitar called a "guitarron." Twelve groups initially signed up for the contest organized by the Mexican embassy in Ecuador, but in the end only seven showed up to participate after meeting strict requirements. Each group had to have at least six members, and use at least six musical instruments traditionally played by mariachi bands. Hailing from all around the Andean nation, the groups performed mariachi classics such as "El Son de la Negra" to an enthusiastic audience. "Mexican music isn't just popular in Ecuador. It's popular around the world," said Cristian Tacuri, musical director of the group Mariachi Monterey, from the Ecuadoran highlands city of Cuenca. "Here, everyone likes Mexican music. We adore this music and we perform it from our hearts." "Most of us make our living from this," Tacuri added. "Music is our life and mariachi music is the best." "Mariachi is Mexican pride and it gives us much pleasure to perform this music in Ecuador," said Paulina Quezada, a violinist with the group Mariachi Real Morelia, from the southern city of Loja. "When we enter a gathering, playing and singing, I am enchanted by the surprise that Mexican music generates; everyone is filled with happiness." One by one, each group steps onto the stage to perform the distinctive music, evoking strong applause. Afterward, the members of each band look confident and satisfied with their performance. But as the competition nears its end, the groups are called together onto the stage and tension grows. The musicians erupt in shouts of celebration and congratulation when the winner is finally announced: It's Mariachi Monterrey, from Cuenca.